Mellor is using the Busworld show at Kortrijk, Belgium, as a springboard for its entry into the mainland European market. The vehicle, which it believes will bridge the Channel, with appeal to a growing need for small buses, is the Strata lowfloor bus – a coachbuilt vehicle engineered with the oversight and approval of Mercedes-Benz which highlights the continued expansion of the product range for the UK manufacturer. Working closely with potential customers and the chassis manufacturer, Mellor believes that its unique qualities is making the Strata the go-to solution for bus operators in the UK and will prove to be equally successful in European markets. Currently, the only lowfloor Sprinter products available in the UK utilise the Sprinter van body to create a passenger saloon with 2+1 seating and a single wheelchair space. Mellor has instead engineered an entirely new body, ensuring it can provide 2+2 seating and a much larger lowfloor section in which two wheelchairs can be accommodated. John Randerson, Managing Director of Mellor, said: “When engineering the Strata, we wanted to find a solution to the limits of van-based conversions using the Sprinter’s robust and durable drivetrain, and avoid creating a carbon copy of existing lowfloor, van-derived Sprinter small buses. Being based on the operators’ favoured Sprinter platform, the Strata meets demand for a small but robust service bus suitable for marginal routes, rural lanes and housing estates. At the same time, Mellor says the Strata delivers around 20mpg-plus fuel economy. 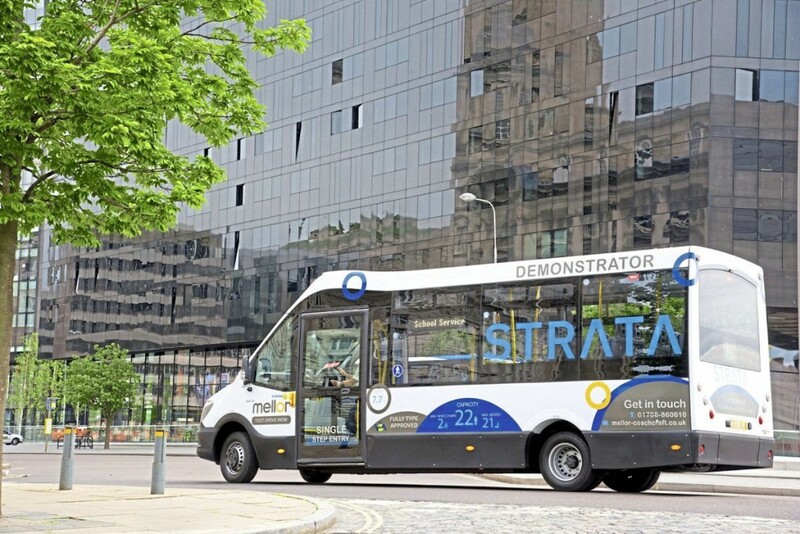 Since its launch in autumn 2016, the Strata has attracted the attention and entered service with UK major bus companies and operators.